On Monday, South Korea’s parliament approved a record-high defense budget for 2017 in the face of a rising threat from North Korea. The National Assembly passed the 2017 budget which included a 40.34 trillion won (US$34 billion) for defense, which had been announced by the South Korean Ministry of National Defense (MND) earlier this year. 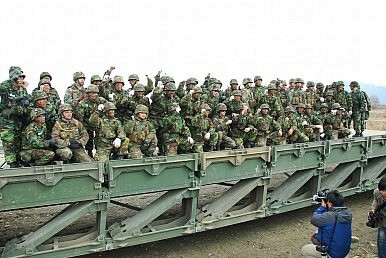 The amount, which is around 10 percent of South Korea’s overall budget, makes it the first time that Seoul’s annual defense budget has exceeded 40 trillion won. It is also a four percent increase from the 38.79 trillion won allocated for defense back in 2016. Within the budget, 28.14 trillion won will be spent on personnel and operating expenses, while 12.2 trillion won has been set aside for defense modernization, including expenses for research and development (R&D) as well as procurement. NK News cited an MND official as saying that the fact that the portion of the budget dedicated to defense modernization had increased slightly beyond the usual cutoff of 200 billion won even after being examined by the National Assembly signaled the commitment by Seoul to strengthen its defenses against Pyongyang this year. The budget boost comes amid a rising North Korean threat, ongoing domestic political turmoil involving the scandal-hit President Park Geun-hye, and uncertainty about the direction of U.S. Asia policy following the surprise election victory of Donald Trump on November 8. Over just the past year alone, North Korea has conducted 25 ballistic missile tests and two nuclear tests. North Korean leader Kim Jong-un has repeatedly said that he runs a nuclear weapon state, a status enshrined in the country’s constitution, making it highly unlikely that he will abandon this course easily. Indeed, some expect Pyongyang to test the new Trump administration with either a provocative act or an olive branch that would have implications for Seoul as well. Thus far, the Obama administration’s so-called “strategic patience” approach of tighter sanctions to force North Korea back to the table has not worked, and Pyongyang has crossed technical thresholds that it had not done so before. Given the possibility that North Korea may develop the ability to reach the west coast of the United States with a nuclear-tipped ballistic missile within the next administration, the challenge is growing ever more acute. In an earlier budget request submitted by the MND, part of it was to be spent on developing elements of South Korea’s three-pillared national defense system against North Korea. The three-pronged system – consisting of the Kill Chain preemptive strike system; the Korean Air and Missile Defense (KAMD); and the Korea Massive Punishment and Retaliation Plan (KMPR) which is designed to destroy Pyongyang with missiles in the event of a nuclear attach– were initially planned for deployment in the mid-2020s. But in October, Seoul said it would move forward that timeline by a couple of years given the rising threat from North Korea. How Will South Korea's New Maritime Security Forum Fare?Thailand Gets Its First New South Korea Fighter JetsThe Trouble With The US Bomber Overflight Against North Korea South Korea, US Sign Cost-Sharing Deal for American TroopsWhat’s Next for the Indonesia-South Korea Fighter Jet Program?